Taking care of my hair has always been a struggle (see this). I’ve tried a myriad of shampoos and conditioners that promise to tame my mess of hair in just a couple of months! But of course, they don’t. I still end up with dried ends, an itchy, flaky, dandruff-ridden scalp, and so much frizz. To combat the dandruff and the gross smell that comes with being in the humid Philippine weather, I shampooed my hair everyday. But nope, dandruff is still there and I never did feel like it was really clean. I also suffer from a lot of hair fall due to breakage, I swear I feel like a cat shedding mounds of fur everyday. But I guess that is expected when you get your hair wet every single day (wet hair tends to break more). To combat the dry, frizzy feel, I slap on tons of conditioner. Then I come across this slew of articles stressing the negative effects of shampoo (most of its ingredients) on hair: that sulfates (the stuff that makes shampoo lather like a dream) dry out hair, that shampooing everyday strips the scalp and hair of natural oils which in turn freaks the scalp out and it churns out more oil than necessary which in turn causes gross, greasy hair (and I’m guessing also that weird smell my scalp gets with that buildup of grease). Natural (sulfate-free) shampoos tend to make my hair feel stiff, and still doesn’t help with my hair fall or my dandruff issue (which I thought it would). And I found that washing with natural shampoos didn’t really thoroughly clean my scalp. So after reading a buttload of blog posts online about the benefits (those links are just the ones I pinned) of No Poo-ing, I’m finally jumping in and trying it out. I will update this post regularly on how my hair/scalp is doing as this adventure goes on. May include photos of my hair for comparison once I get someone to take a photo of the back of my head for me. This product with vitamin H and silk protein intensely moisturizes dry, rough hair. For hair that feels soft and smooth. Delivers intense moisturisation, targeting the areas your hair needs it most – the key to salon silk moisture. Contains silk protein and vitamin H.
I saw this at the supermarket in a trial-sized version, 90mL each for the shampoo and conditioner and cost about Php90 for the pack. I picked this up because I heard raves about the Tresemme heat protectant and for some reason I thought this shampoo and conditioner would work great. And it’s for dry and frizzy hair, and my hair is exactly that. And it was cheap and tiny, perfect for trying it out for my hair for a couple of weeks. What I like about the two products: Smells great and it lasts for the whole day, so that’s good. I found myself sniffing my hair before I went to bed. The shampoo lathered up very easily, which is not an easy task on my hair. That’s about it. 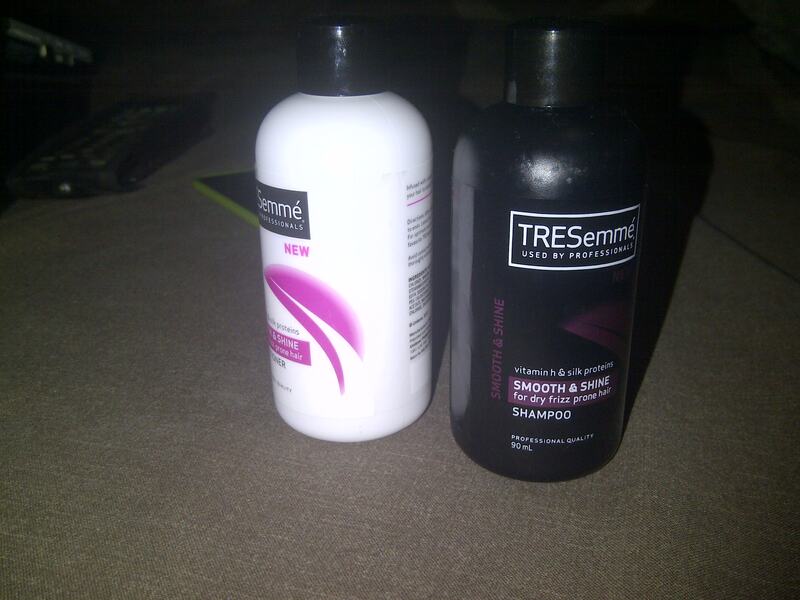 What I don’t like about the two products: It didn’t help with my tangles, if anything, it made my hair tangle up more and adding to my hairfall. Not cool. And a very weird side effect, a pimple started growing on my scalp (what!) somewhere behind my left ear and a couple inches above my nape. I have never ever had pimples on my scalp. And I’d get this stabbing pain on that spot at random times when my hair moves. I swear to god, so weird. I immediately stopped using this because, damn, I don’t want any stabbing pains anywhere in my body thank you very much. Rating: 3/10 Well, it smells nice. And my hair kind of felt soft, but I didn’t feel like my hair was being hydrated enough. And a pimple on the scalp? FFS. 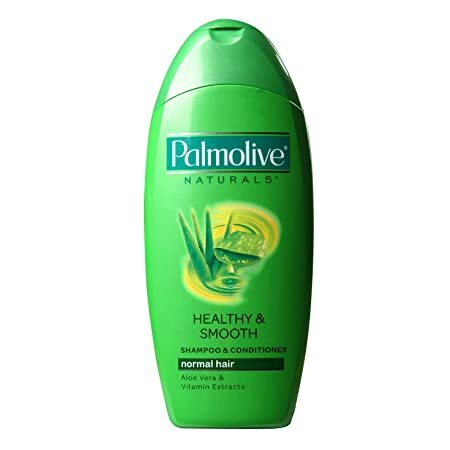 Palmolive Naturals Healthy and Smooth Shampoo (with aloe vera and vitamin extracts) promises tangle-free, silky smooth hair that wouldn’t need combing for hours on end even if left untied. I picked this up because my mom told me it indeed makes your hair smooth and silky. It’s for “normal hair” (whatever that means) and I have long, thick black hair that is a bit coarse and has never been shiny on it’s own because of the aforementioned coarseness. So I was a bit skeptical about the results this shampoo would give me. What I like about this product: Well, it did make my hair incredibly smooth and soft, which doesn’t happen with just shampoo. It has a pleasant scent that is not overpowering and I actually really like it. The scent lasts through the day even in the hot Manila weather. What I don’t like about this product: While it did leave my hair soft and silky, it didn’t help with tangles and still resulted in the hairfall I get due to breakage. And right on the day I started using this product, I developed an annoying rash on lips (of all places!) You see, I sometimes dilute shampoo in a little water to make it easier to distribute through my hair, so somehow some of that mixture trickled down my face and irritated my lips. I wasn’t using any new products aside from this one, so I landed on this conclusion. It was a nightmare, but thankfully the rash went away when I stopped using this shampoo. I kind of want to use this shampoo again to see if the rash comes back because I would really want to keep using this, but I really don’t want that rash on my lips to appear again so I’m not taking any chances. Rating: 6/10 Maybe I’ll go back to this shampoo again sometime in the future, but for now, I’ll just be on my shampoo search for the meantime.